1. Wind from multiple cones at once. I weave with fine threads and generally wind with three or four cones at once. Â It speeds the winding process immensely. 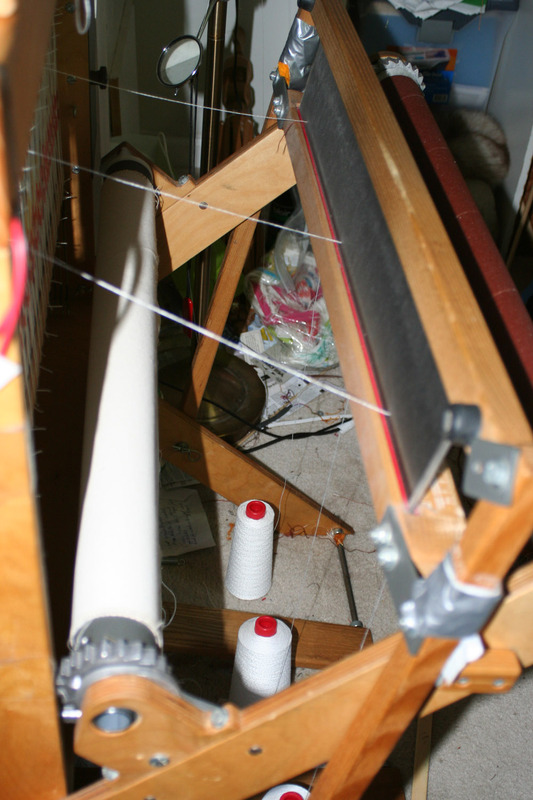 To make sure the yarn feeds smoothly off the cones, I set the cones directly under the beater of my loom, and run the yarn up through the reed directly over the cone, so it winds off smoothly. 2. 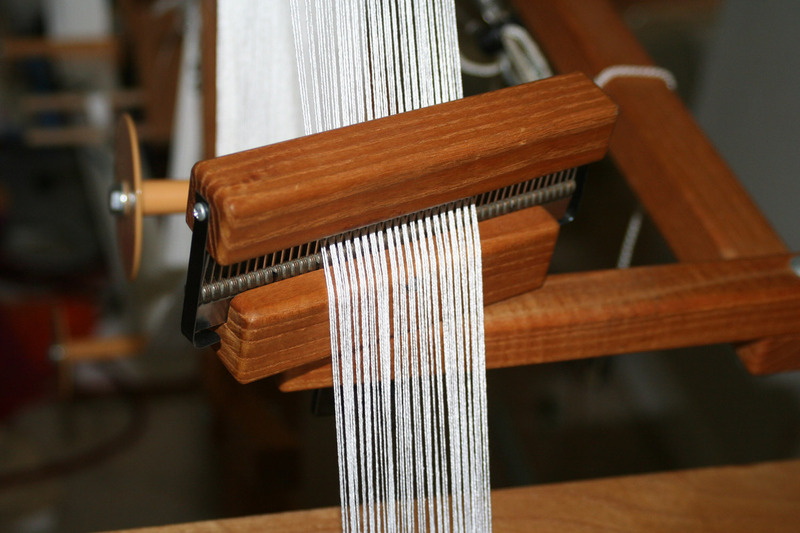 Â Use a tension box to even out tension as the yarn winds onto the warping wheel. Sandra Rude suggested this to me when I was having trouble with tension on a fine silk warp. Â I set a tension box on the back beam and run the yarns through the comb (to keep them separated) and then through the pegs. Â I’m not trying for tight tension, just even tension as the yarn winds onto the warping wheel. 3. Â Mount a paddle to the tension box to maintain the cross. Because I work with fine threads, which tangle easily, I prefer to use a cross instead of securing the sections with masking tape. Â Here is a photo of the paddle (white thing) mounted to the tension box. Â It serves two purposes: first, it lets me create the cross when winding from multiple cones, and second, it keeps the threads neatly together for winding on. Notice the paddle at the front of the tension box; this creates the cross. 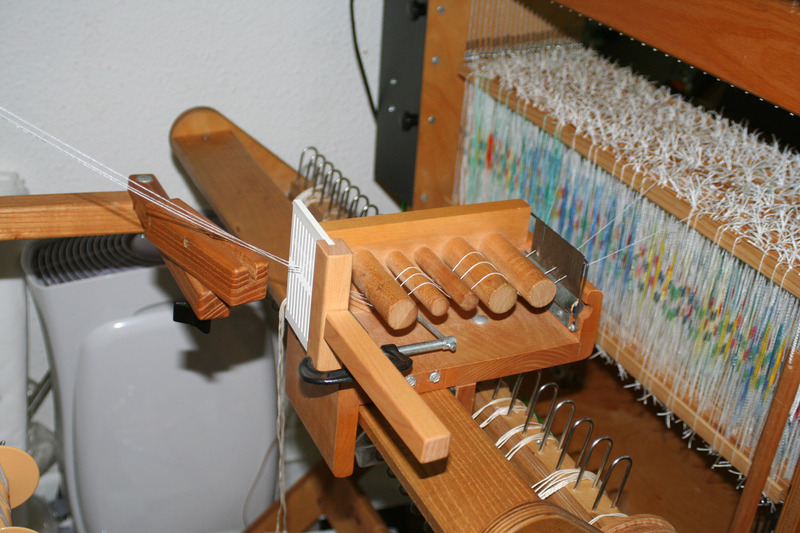 To use the paddle, I gently pull down on the threads as they come out of the paddle, and put a finger between the ends. Â I then pull back slightly with my finger, separating the top ends from the bottom ends, until I get to the crossmaker. Â I put the top ends over the first peg of the crossmaker, and Â the bottom ends under. 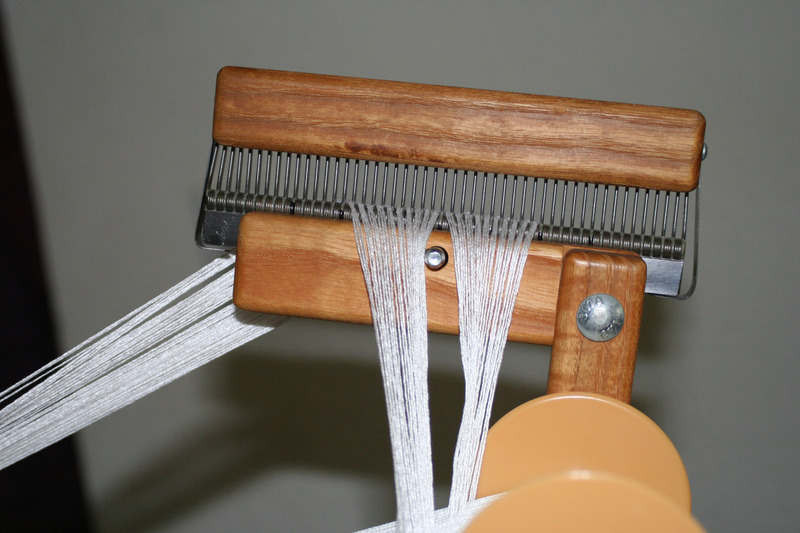 Â Then I go back to the paddle and pull the threads up, putting a finger between the ends. Â Then I separate top ends from bottom ends and transfer the arrangement to the second peg of the crossmaker. Â Then I wind onto the wheel. 4. Â Wind multiple sections at once. I use a convenient number of dents per inch – usually 10 because in my experience that is the minimum width you can use and still have the section wind across the full width of the one-inch section. Â But I’ll use more if I need to, to get the correct number of ends in each section. 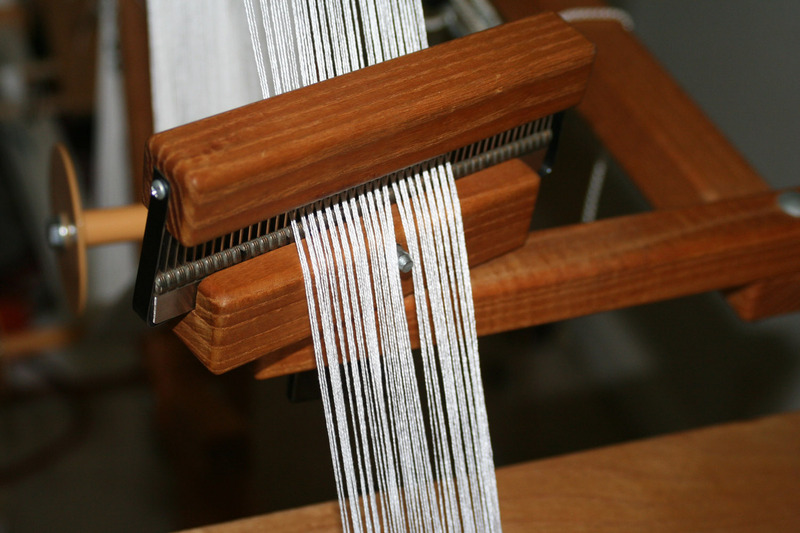 Once I am done winding, I tie off the cross, and tie a temporary knot in each section to keep them distinct and also to prevent them from accidentally slipping back through the comb. Â Then I put the top on and transfer the comb to the position for beaming. Next I attach the sections to the back beam. Â To do this, I tie a knot in the nearest section, and loop a larks-head knot around the section behind the knot, as usual. Â I then loop a larks-head knot around the second section, and pull the larks-head knot tight around the grouped threads, but do not tie a knot in the end of the second section. Â In fact I untie the temporary knot so there is no knot at all. Now I turn the warp beam just enough to put a little tension on the knotted end. 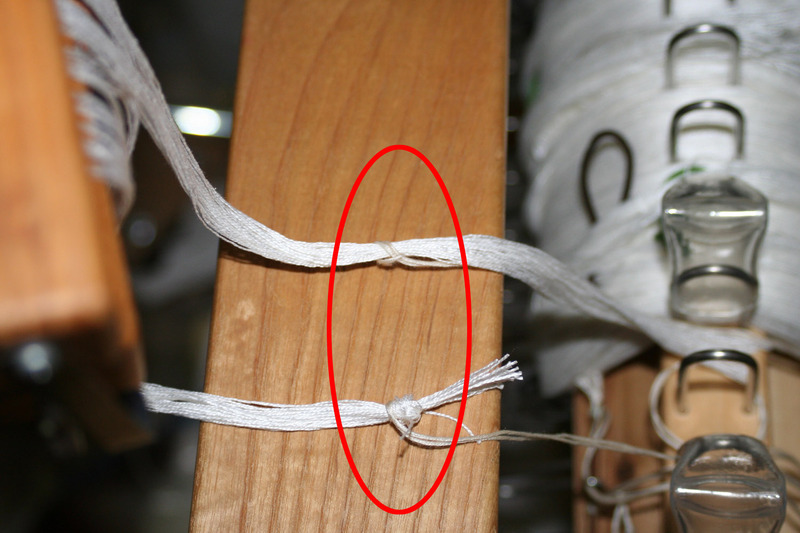 Â Because the larks-head knot is pulled tightlyÂ around the threads in the second section, it should not slip with light tension. Then I back up the warp beam to release the tension, and tie a knot just barely above the larks-head knot on the second section. Â Because the larks-head knot is pulled tight, it does not slip and it is easy to adjust the knot. 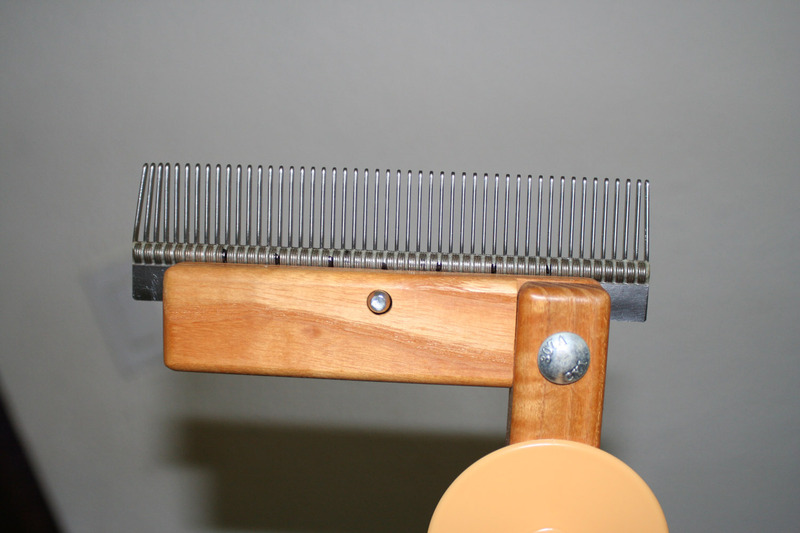 The warping wheel comb, with the peg fully inserted. Notice how it splits the yarn. 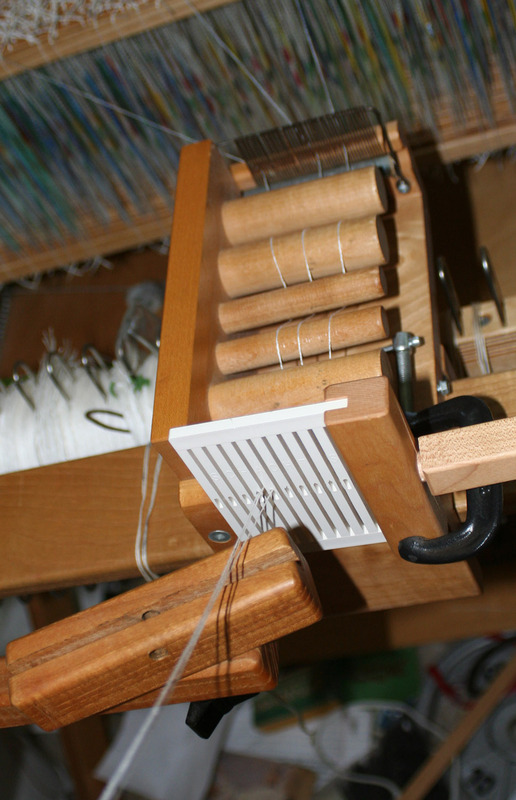 The warping wheel comb, with the peg only partially inserted so it doesn't split the yarn as it winds on. A partially wound section. See the nice even tension? 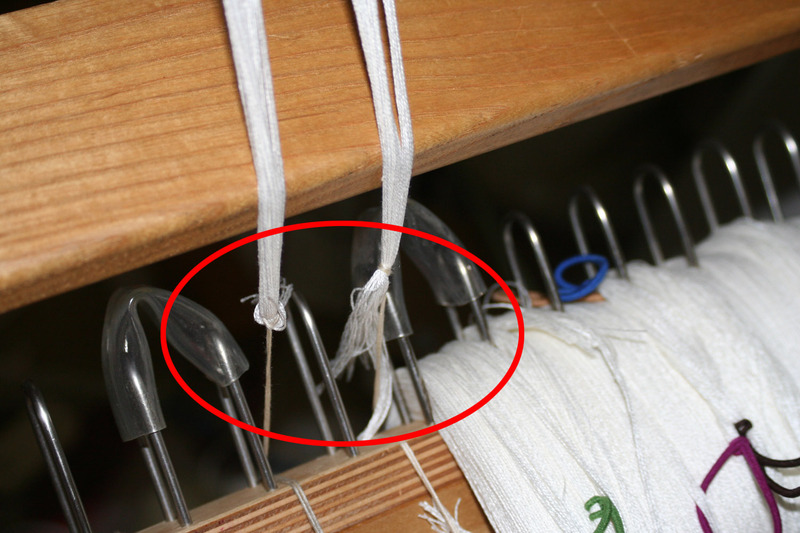 If I find that the thread is building up on one edge (making that edge tighter), it means the warping wheel is too close to that edge. 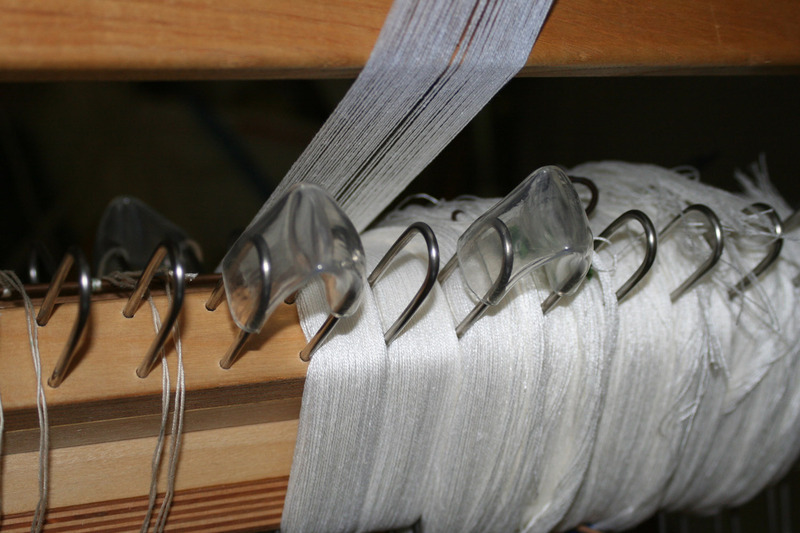 Â If the thread is building up on both edges (tight edges and slack in the middle), then the comb needs to be angled more sharply – the section is too wide and so is building up on the ends. Â If it’s tight in the middle and loose on both ends, it means the comb is angled too sharply; the section is too narrow, and isn’t building up enough on the ends. That’s it! Â I hope this has been useful to you – if you still have questions, feel free to leave a comment, and I’ll answer if I can.